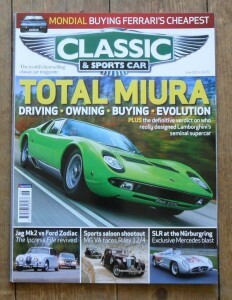 June 2013 of the British Magazine, Classic and Sports Car. The cover feature of this issue is the Lamborghini Muira. Other articles include items on the Jaguar Mk2 vs the Ford Zodiac, Mercedes SLR, Ferrari 412, MG VA, Riley 12/4 and many more.